← What Metal Detector Should I Get? An important tool that can help you be successful in your hunts is a good pinpointer. 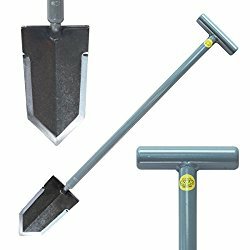 A pinpointer is used to help locate the target after you dig. You’d be surprised how camouflage a coin can be in a handful of dirt! Sometimes targets are in the side of the hole, and having a good pinpointer can help you dig more targets in less time, and that is always good. I have used a couple different pinpointers, but I have to admit that the Garrett Pro-Pointer is the best I’ve ever used. It operates on one 9 volt battery, and the tone gets louder and beeps faster the closer you get to the target. The Propointer also vibrates, giving you another indicator to let you know that you are closer to the target. Once you are within an inch of the target you will get a constant tone, and vibration. A good pinpointer is just as important as a good metal detector. I would never hunt without one, although I have when I first started. I went from waving a handful of dirt at a time in front of my coil, averaging around 5 minutes to recover a target, to being able to recover a target in less than a minute with the Garrett Pro-pointer. At around $127 for the Garrett Pro-Pointer Pinpointer, sticker shock can set in for some new detectorists, but let me honestly tell you that the propointer will be the other half of your detector! Once you have it in your hands and see what it can do in the field, you will surely agree that the propointer is one of those items that are worth every penny you spend for it! See this article, and see the propointer in action for yourself and you can see that the propointer is a definite must have in your detecting arsenal. This entry was posted in Arkansas Metal Detecting, Kansas Metal Detecting, Metal Detecting, Metal Detecting Equipment, Metal Detecting Products, Metal Detecting Tips, Metal Detector Reviews, Product Reviews and tagged arkansas metal detecting, Detecting Tips, garrett pro-pointer AT, Garrett Pro-Pointer Pinpointer, garrett propointer, metal detecting, metal detecting blogs, metal detecting tips, pinpointer, Pro-Pointer, target recovery. Bookmark the permalink. 2 Responses to Why Get A Pinpointer? After reading through the article, found that it contains some useful knowledge about it and like your way of writing , i will pay more attention to your article and hope that you can also pay more attention to my website. Thanks! I’ll be sure to check out your site too!